Thank you to Bookouture and NetGalley for the advance copy I received in return for my honest review. DI Kim Stone is back! If you thought Silent Scream was good, then you’re in for a massive treat because somehow Angela Marsons has managed to do the impossible: the second in the DI Kim Stone series is even better than the first! Can you say ‘sociopath to the max’ 10 times! In psychiatrist Alex Thorne, Marsons has created a villain so evil and twisted that you can’t help but marvel at her wicked brilliance. It’s Kim’s job to prove that Thorne is a manipulative, deceitful conniver without an ounce of moral fibre – the true epitome of a sociopath. This is an intricate study into the heart and mind of pure evil. As the body count rises and a race against the clock ensues, one can’t help but feel one’s heart rate and blood pressure rising as we do our best to keep up with the chase. With every shrewd twist and turn of the plot I actually felt breathless at times, marvelling at the skill and expertise that were applied to ensuring that no loose ends were left and that all questions were eventually answered. DI Kim Stone reminds me of that quote from Shrek ‘Ogres are like onions: they have layers’. This describes her perfectly. Just when you think you know and understand her, she’ll surprise you by doing something totally unexpected! The banter between her and her trusted team – especially Bryant who does his best to look out for her, as much as she’ll allow – is quick and easy. She knows that at all times, despite her harsh exterior and sometimes inexplicable behaviour, that she has their unequivocal support. Each of their characters has been allowed to develop and I can’t wait to read more books in the series so I can get to know them better. This book is fast-paced, well-constructed and gives us a chilling look at some of the most contemptible individuals who really are the dregs of humanity. On the bright side (yes, there is one), there are also those who are full of compassion and empathy, willing to reach out a hand to those who need it. Well done to Angela Marsons who is establishing herself as a tour-de-force in the crime thriller genre! 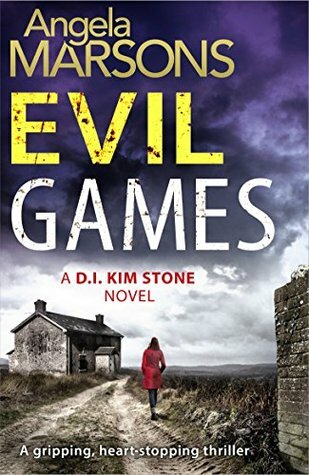 Evil Games will be published on 29 May 2015.